The Worldwide Leader once again dominated the sports scene in 2012, though not always for the reasons they'd prefer. In a year of Tebowmania and Linsanity, it was often the machinations inside Bristol that made for the most interesting news. 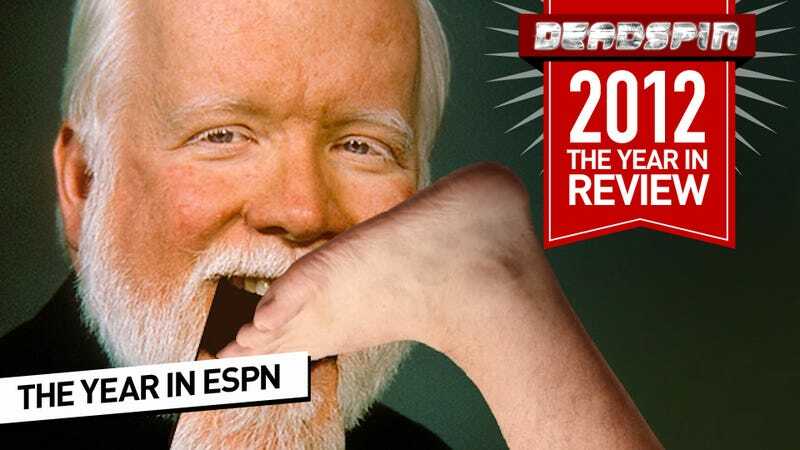 Join us, won't you, as we look back on our favorite ESPN stories of the past 12 months. Or just read about it on Wikipedia. It was Tim Tebow&apos;s 25th birthday today. Did you hear? ESPN Finally Disavows Its Tebow Coverage: "We Didn't Handle That Very Well"
ESPN Finally Disavows Its Tebow Coverage: "We Didn&apos;t Handle That Very Well"
Why Is An ESPN Vice President Spreading Rumors That I'm Straight? Rob Parker Lowers The Bar On First Take: Is Robert Griffin III "A Brother Or A Cornball Brother?"